“Kendal Creates” includes all types of artwork: watercolors, oils, drawings, photography, mobiles, carved wood, pottery, knitting and weavings. This year’s display includes artwork of two deceased residents, submitted by their spouses, a refinished chair, birch baskets and a multimedia book, which is displayed in a glass cabinet outside the Marketing Department. “Birthdays are good for your health. Studies show that those who have more birthdays live longer,” is just one of several fun quotes found in Polly Carroll’s whimsical book. “‘Kendal Creates’ gives you an insight into people, and the show means an awful lot to residents,” says Robert Taylor, who is co-curator of the show with Sheila Eckstein. The biennial show alternates with “Kendal Collects” and will be on display until August. 20. Painting has been a lifelong companion of Sharon Furrow’s. She painted during her college days at Ashland University, where she minored in art, taught art to high school students and took classes at the Corcoran Gallery in D.C. and St. John’s College and Maryland Hall for the Creative Arts in Annapolis. Since moving to Kendal in 2015, though, Sharon is having difficulty finding time to paint. “There are so many things to do here that I am so easily distracted from art,” she says. In addition to her involvement with Kendal’s Newcomers and Lifelong Learning committees, Sharon has been volunteering at FAVA's 18th Biennial Exhibition of Contemporary Quilts. She has found time to take a couple of watercolor classes with resident artist Don Parker and hopes to soon reserve a spot in the Art Studio, so she can get back to painting. For “Kendal Creates”, Sharon submitted two watercolors and an oil painting entitled “Palette Knife, Still Life”. “The instructor challenged us to paint using only palette knives. I love using this technique,” Sharon says. 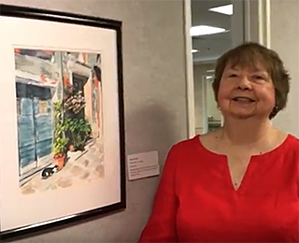 Sharon’s watercolors were inspired by her travels: “Pots” is an assemblage of charming pots she saw while visiting Kent, England, and “Vernazza” focuses on a doorway she came across during a walk in Italy. “I love painting doors, especially in Italy and Europe, they have such a sense of mystery,” she says. Ted Nowick started his artistic career as a ceramist. He later began experimenting with large-scale clay pieces and moved into abstract sculpture, working primarily in wood, stone and cast metal. His most recent sculptural pieces are mobiles made of a variety of materials, including metal, wood, cloth, paper and rattan. Ted moved to Kendal at Oberlin in December of 2003 and now works out of his studio at Ginko Gallery, where his mobiles are displayed and sold. "I am continually entranced with the interplay of color, texture, form, and movement, which is never as satisfying for me in any other medium as it is in my mobiles," Ted says. Ted studied for four years at the Corcoran Gallery School of Art in Washington, D.C. He has studied art abroad at the University of Loughborough in England and, in this country, with James Stark at the State University of New York at Binghamton, James Sutter at Skidmore College in Saratoga Springs and Deborah de Moulpied at the University of Maine in Orono. His works have been shown in a number of places including: Washington, D.C.; Bethesda; Annapolis; Saratoga Springs; several places in Maine; and Kailuum, Mexico. In 1990, Ted received an award for excellence in studio art from the University of Maine. For more than twenty years, he helped teach a summer course in three-dimensional design at Skidmore College. He is married to Robert Taylor, whom he met in 1975 while living in Washington D.C.
Robert is a writer, and this year for “Kendal Creates” submitted a collection of birch bark baskets he made while attending classes at the Haystack Mountain School of Crafts on Deer Isle, Maine. “These are made entirely of natural materials. In addition to the birch bark that makes up the body of the baskets, the handles are made of pine roots, and the baskets are sewn together with strips pulled off of those roots,” Robert explains. When he and Ted lived on the coast of Maine, they attended a number of sessions at the Haystack Mountain School of Crafts, attended by artists from around the world, as well as a special five-day session specifically for Maine artists. “We both went probably 12 to 15 times during the years we lived nearby in Blue Hill. I did a number of different kinds of things – papermaking and bookmaking primarily, but also drawing and printmaking. One of my very favorites was the year I made baskets from birch bark, the pieces now on display in “Kendal Creates”, he says. Robert has published five books – four novels and a collection of short stories and a novella. He donated the Robert Taylor Papers to Oberlin College Special Collection in 2016.